Clearly pork belly is not a low in fat or calorie food, however in moderation it isn't too bad. I mean come on I ate it as a salad so give me some credit here. Pork belly, get in my belly! The pork belly came from Trader Joes. It was cooked a few minutes on each side (all four sides for a total of 12 min) in a cast iron skillet over medium heat. After that it was broiled fat side up for 10 minutes. 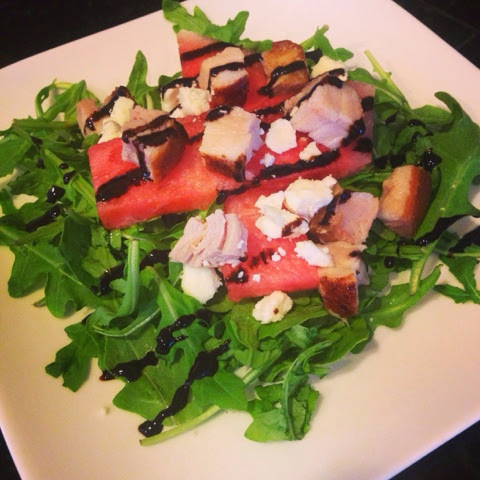 This is a bed arugula with some sliced watermelon, a sprinkle of fat free feta, 1.5 ounces of pork belly and a drizzle of balsamic glaze. Not necessarily clean or challenge approved, but a special low carb fatty treat.